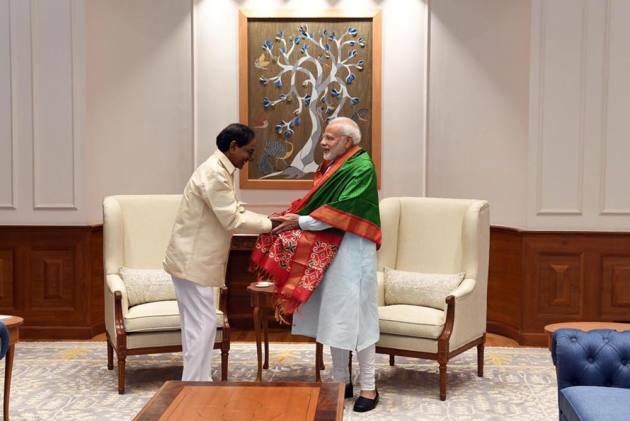 Telangana chief minister K. Chandrasekhar Rao app­ears to have two priorities at the moment, in this order: checkmate the opposition with early polls and retain power for another term. If it had been a game of chess, the 64-year-old’s calculative move to advance the state elections by at least six months, before the scheduled fixture in April-May next year, would be a fine gambit. But politics follows its own set of rules. The Opposition, especially the Congress under whose wings he cut his political teeth in the 1980s, accused him of being afraid—that his pot of alleged wrongdoings will brim over by the time the polls are held in 2019 and that voters will reject him. Scared? Who? The mood in the ruling Telangana Rashtra Samithi (TRS) is full of confidence, despite dissenting voices reported within the party for the first time. Party leaders justify KCR’s move, saying surveys conducted by their own party as well the Congress and BJP give a clear edge to the TRS. Besides, they say, the seed of early polls was sown when the Narendra Modi government proposed simultaneous elections, an idea the Election Commission has ruled out for now. The TRS and Naveen Patnaik’s BJD endorsed the Centre’s proposal, though several states ruled by the Congress and other opposition parties—for instance, the Trinamool Congress in West Bengal and Telugu Desam Party in Andhra Pradesh—have apparently opposed it. TRS legislator Rajeshwar Reddy calls the Opposition’s challenge far-fetched as the “positive outcome” of the surveys shows “our development and welfare schemes have reached every household in the state. Yes, whether it’s irrigation or agriculture or power, we have done exc­eedingly well and this was evident from various central agencies official statistics”. He goes on to list the feats under KCR’s leadership that the new state, carved out of Andhra Pradesh in 2014, had achieved. “We have a record of sorts with a steady 17.3 per cent growth rate for the past four years, which many BJP-ruled states haven’t been able to do. That being the track record, why should we be scared to face the electorate?” There are more: 60 kilos of rice and a monthly handout of Rs 1,000 to the poor, an insurance cover of Rs 5 lakh, and schemes such as “shadi mubarak”, “shelter for all” or “vision to all” (kanti velugu). KCR wants to dissolve the assembly and hold early polls, but will the Election Commission play along? The ball is in the EC’s court. As for KCR, he is unperturbed. He wants to dissolve the state assembly and opt for early polls. He has had successive meetings within his cabinet, followed by extended party meets attended by off­ice-bearers, MPs and MLAs in New Delhi. The TRS under KCR’s direct supervision will hold a massive public meeting—Pragathi Nivedana—on Sep­tember 2 at Kongara Kalan on the outskirts of Hyderabad. It says 2.5 million people are likely to attend. The stage is perhaps set for an announcement that would give some clarity on early polls. But there is a catch. Six months are available for the Election Commission to hold polls after the dissolution of the state assembly. Will the EC play along to suit KCR’s agenda? If it does not agree to early polls in November-December and holds the assembly and Lok Sabha elections in February 2019, what happens to KCR’s demand? The ball is actually in the EC’s court. How it will play out is anyone’s guess.